Jordan’s rose-colored sandstone city, off maps for centuries, is a bucket list experience not to be missed. On the edge of the Arabian desert, hidden in mountains south of the Dead Sea, Petra had disappeared from maps for more than 1,000 years. 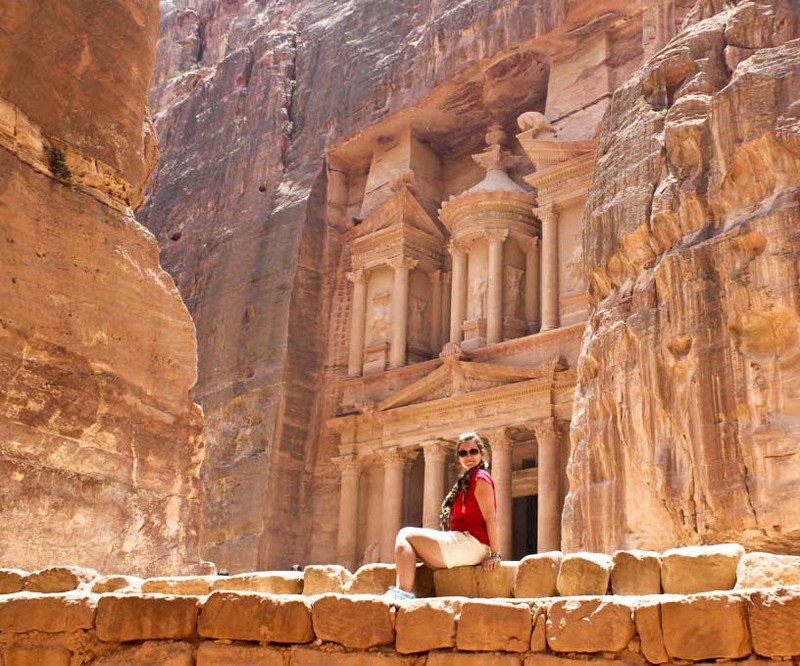 Thought to be at least 3,000 years old, Petra is one of the ultimate bucket list destinations. The city’s architectural beauty survives from it being chiseled directly from the sandstone mountains. Temples, tombs, a highly sophisticated hydro system, and a monastery are linked by trails, steps, and ancient caravan routes. 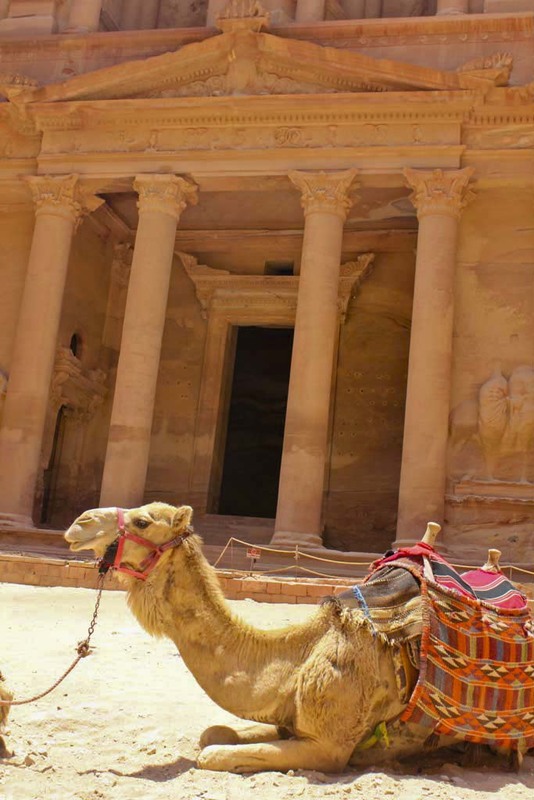 Journey back in time with me to Petra and become part of My Jordan Journey. Much of Petra’s fascination comes from its setting on the edge of Wadi Araba, part of the Great Rift Valley, encompassing scenes from Indiana Jones and the Last Crusade as well as Lawrence of Arabia. A symbol of great engineering and ancient commerce, the city is etched in a monumental landscape of sandstone mountains protected in all directions. The only entry to Petra is along a 3-mile road, the Siq, that meanders through a winding narrow gorge in places only a few feet wide with walls rising 300 feet on either side. Ancient water channels that brought water to the city are carved into the canyon walls. Walking through the Siq is indescribable. It’s extraordinary to see the waterways perfectly intact, to touch the sophisticated channels, and to feel the small bursts of sand blowing against my skin. When, the Siq abruptly ends, you are thrust upon the most impressive of Petra’s buildings. 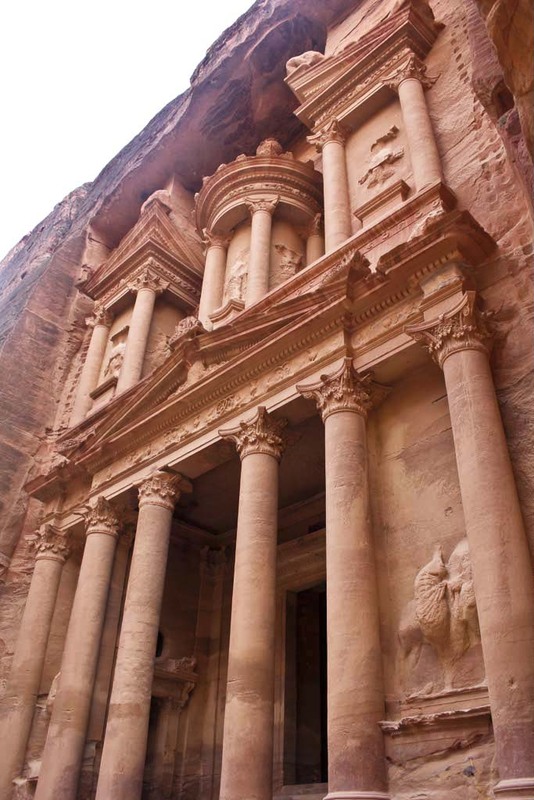 The Treasury, or Al-Khazneh in Arabic, is the most spectacular monument in Petra. It stands an imposing 39.5m high and is impressively carved out of a single block. 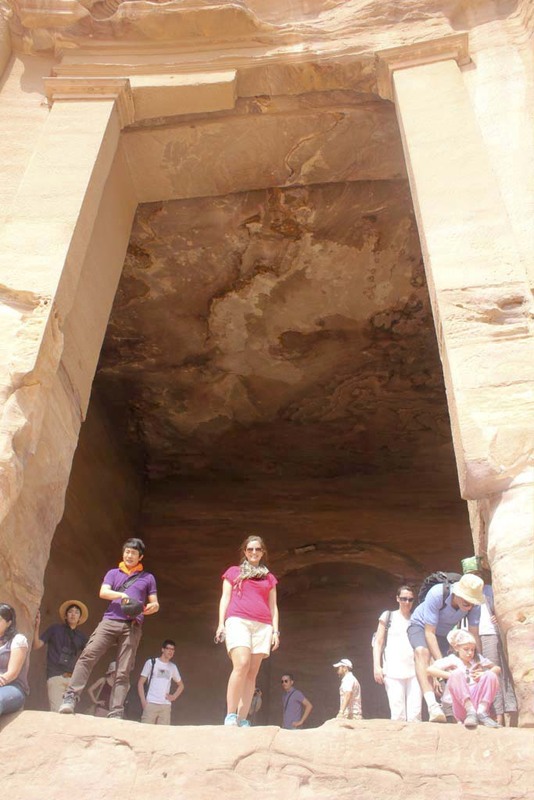 The monuments name comes from a local Bedouin legend that pharaoh hid a treasure in the urn at the top. I could actually see the bullet holes from people shooting at the urn to try and retrieve the treasure. I imagined the bustling commerce, traders, and markets all going on right before me. I didn’t have to envision the camels or mayhem of people since that was still there. If something impressed me more than the Treasury, it would be the donkey that took me up the steep cliffs to the Monastery. Climbing the cliffs on the edge while atop a donkey gave me a new fear that I didn’t realize existed within me. It might have only taken 20 minutes rather than more than an hour but those 20 minutes seemed a lifetime. He, Jack, hovered over the edge of the cliff like a Jedi with precision and fluidity. He had mastered that mountain, yet I wasn’t comforted by his constant need to hang out on the very edge of every step. The journey was worth it when I arrived at the Monastery. 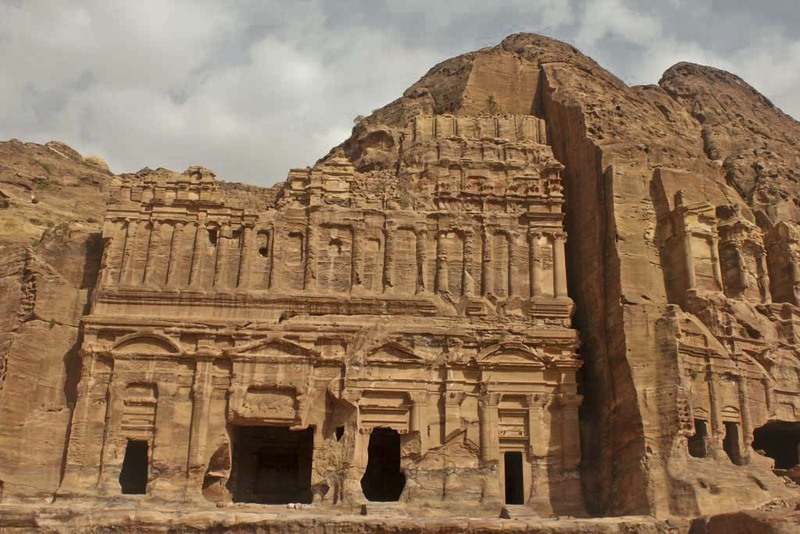 Once a series of tombs, the 137-foot high Hellenistic temple facade looks down on the grandeur of Petra. The beauty that unfolded from my lofty perch was magnificent. 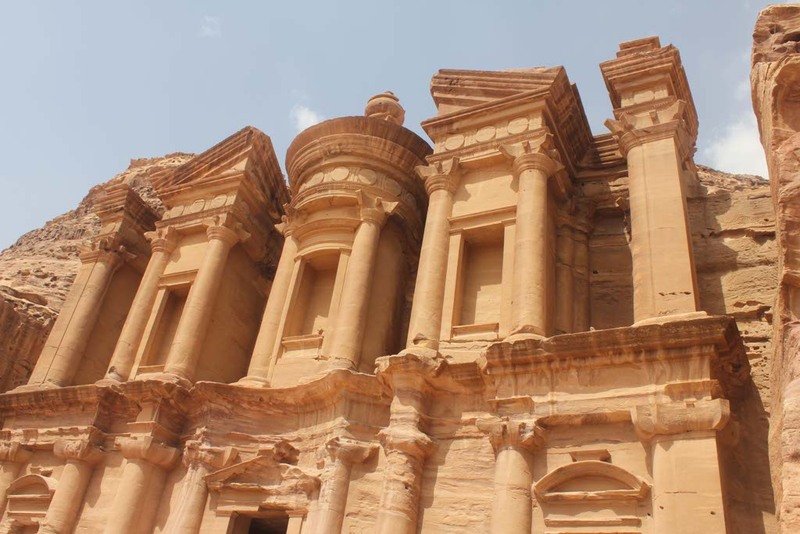 Petra is not in ruins; it is a well-preserved city that holds treasures greater than any monetary value. With only one day to explore the ancient city, the donkey was a worthy investment, but nothing could convince me to ride it back down the cliffs from the Monastery. I made the return trek on foot and took as many photo opportunities as possible. At the bottom, I rode the donkey once again, avoiding the extensive hike on foot. I was able to explore the remainder of the city and still make it back to the bus on time. 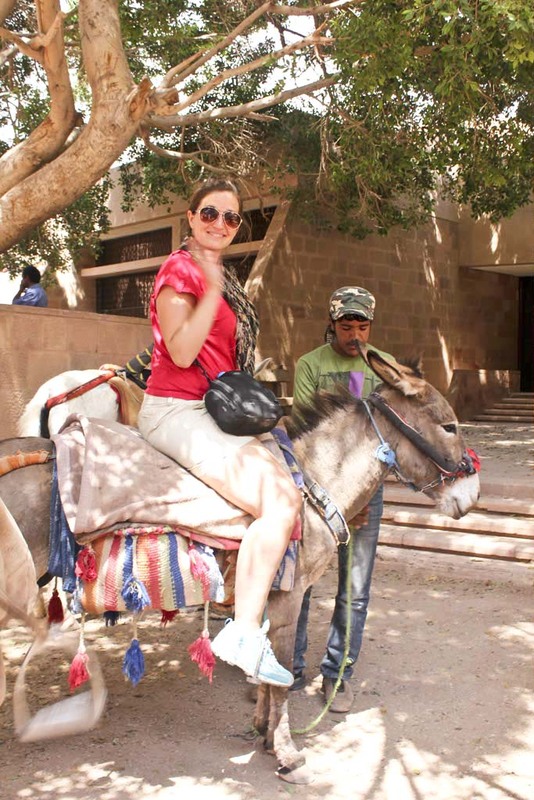 If I could make one suggestion while visiting Petra, it would be to pay the small fee to ride the donkey. Petra is impressive both in size and temperature. Save your feet and go donkey riding. The World Heritage Site stretches across 400 square miles; you’ll want to take them all in. Although I made this journey alone, Jordan with kids would be a great adventure. I imagined Athena like a young Lara Croft, discovering the hidden beauties of Petra with me. I guess it’s just another reason to return to this mysterious, beautiful country. This entry was posted in Jordan, Travel and tagged bucket list, Bucket List Publications, bucketlist, Jordan, Lesley Carter, MyJordanJourney, VisitJordan by lesleycarter. Bookmark the permalink. This is definitely a place that I would like to visit someday. It’s a bucket list worthy journey. I hope you make it there. I went there twice, actually — and on both occasions, it seemed magical. I’d definitely put it on the list of top 5 things to do in Jordan, along with Jerash and Madaba! Great to hear. I’m going to create a list of my top five experiences in Jordan so the other two are good to hear as well. Thank you! Have you ever been to Jordan? G’day and WOW! Your blog post today is MY Bucket List, TRUE! Thanks for allowing me to visit through your eyes unique view! I hope you make it there! It was always on the top of my list and I wasn’t disappointed. It’s such an amazing place! When I was a young kid, my dad used to take business trips abroad. He would take pictures and have them developed as slides. Then he would force the family to sit through a slideshow of his trip! LOL His pictures of Petra were some of the few that had my full attention. How come I’ve never heard of this place? It’s amazing! Thanks for taking me there. Petra was one of the top places that I wanted to visit in Jordan, but with so many bucket list places in one country, it’s hard to visit them all. What did you hear about the most? Fabulous photographs and write-up, Lesley. I am thrilled that you were able to experience the lonesome majesty of Petra. 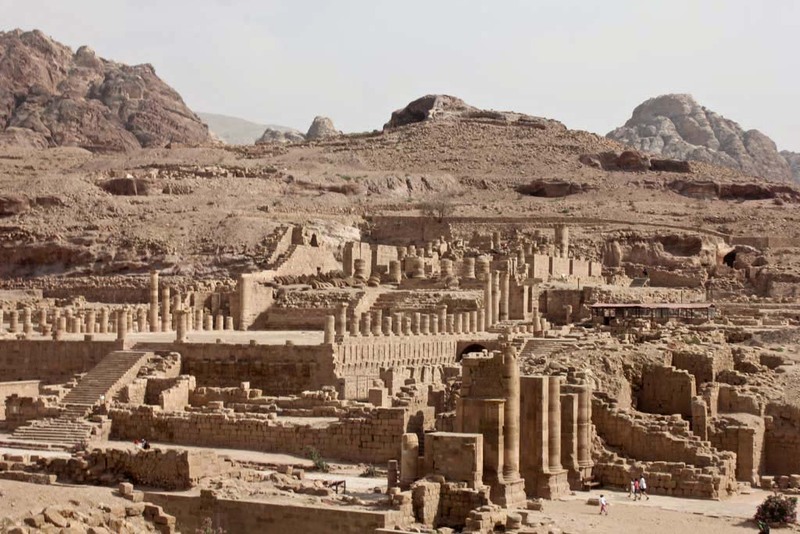 It is one of many astonishing archaeological sites that is not as widely renowned as it ought to be, yet comparatively few places can rival Petra’s enchanting atmosphere and setting. Thanks again for the superb entry! so wonderful! I’ve been meaning to visit Jordan but have trouble gathering like-minded people to go have an adventure! What a wonderful thing you have done. Petra is on my list. Nice photos, nice comments, not a half bad donkey. That sounds even more scary. How long did it take? As I recall Lesley, it was about an hour each way. I think Charlie the Mule realized I was a couple of pounds beyond what I was supposed to weigh and wanted to show me my ultimate demise by kicking his legs over the edge. (grin) He also tried to bite me. Since then I have backpacked into the canyon several times plus rafted the Colorado through the Canyon. What a beautiful site…. I had not seen it before. Thanks for sharing. Amazing. I’ve been fascinated with that place since seeing “Last Crusade.” Don’t know if I’ll ever make it there myself, so thanks for sharing the great photos! Stunning pictures! It makes my plans to see Petra one day myself even more firm! Thank you for posting! Oh yes! I hope I can cross it off of my list one day, too! What a beautiful place. Loved seeing it through you eyes. Looks like a magical place! love the pictures and your descirption of r everything very nice! Wonderful pics of a magic place…. some years ago a NZ woman married a Bedouin who she met there, and lived there as a Bedouin herself, for about fifteen years until he died, I think… what a strange destiny !!! Maybe 200 people said already. But I want to too: This is an awesome place which I dearly want to visit, truely a Bucket LIst item! Thanks for sharing it with us! I went to Petra a few years back and it was incredible. Can totally remember my donkey riding experience too!.. haha, so scaryy.. It is an awesome place that was at the heart of trade (it was built on the crossroads) in its time. Would definitely love to come visit one day. Definitely one of the places on my bucket list as well! Beautiful pictures! Petra is such a beautiful place. I would love to go there one day! Impressive photos and I’m sure it was an impressive trip. Thanks for sharing with us! Wow! Great shots and love the story. Beautiful pictures. Great recommendation about the donkey. I’ll look for a ride……..
Great photos. Petra is someplace I have been wanting to visit. You look great, I am glad you are enjoying life to its fullest. Petra and Dead sea are on my travel list, no doubt. I will plan a trip to Jordan some time. 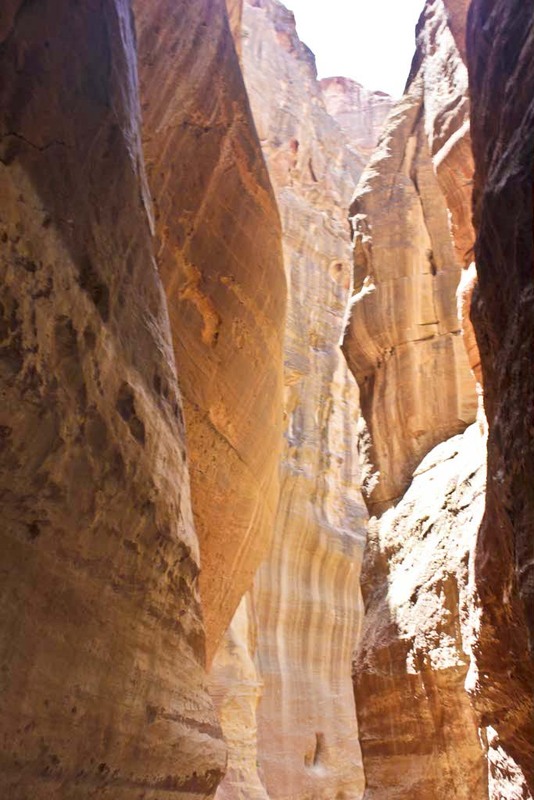 Your Jordan pictures are truly amazing…continue with your journey of the world. I returned from Nepal tour recently, will post about my journey soon on my blog. Simple breathtaking. I have wanted to Petra for a loooong time. Over-the-top STUNNING! Pictures as well as the building. Love the colour of the stone. Hard to take it all in and I’m only looking at pictures. Wow. Jack the donkey really sounds amazing.